In a medium pot, boil potatoes until very tender. Reserve. In another medium pot, steam cauliflower until very tender. Combine with potatoes and reserve. 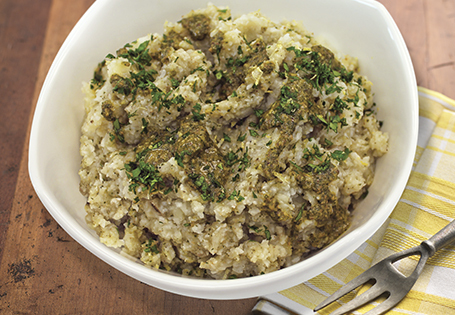 While cauliflower and potatoes are cooking, combine pesto ingredients in a food processor and blend until smooth. Reserve. Smash potato cauliflower mixture until desired consistency. Fold in 1/3 cup of pesto, roasted garlic and chicken broth. Season to taste with salt and pepper. Top with 2 tablespoons pesto; garnish with chopped parsley. TIP: Store remaining pesto in refrigerator for up to 1 week.